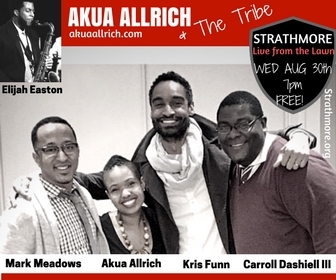 AKUA & THE TRIBE @ THE STRATHMORE | LIVE ON THE LAWN | WED 8/30 7pm FREE! STRATHMORE Live from the Lawn | 7pm FREE! “Akua Allrich The D.C. native’s latest release, “Soul Singer,” mixes jazz and African rhythms with vocals in multiple languages. She performs as part of Strathmore’s Live From the Lawn series. 7 p.m. Previous post Akua Allrich & The Tribe! Concerts! Beyu caffe 8/11 | Mr. Henry’s 8/12! I would like to express some appreciation to the writer just for rescuing me from this issue. After exploring through the the web and coming across techniques which were not beneficial, I thought my entire life was over. Being alive minus the approaches to the issues you have fixed by way of your main posting is a crucial case, as well as ones which may have adversely affected my entire career if I had not noticed your web page. Your personal capability and kindness in taking care of the whole thing was crucial. I am not sure what I would’ve done if I had not discovered such a subject like this. I’m able to at this point look forward to my future. Thanks a lot very much for the specialized and effective help. I will not hesitate to refer the sites to anyone who would need counselling on this matter. I precisely had to thank you very much yet again. I’m not certain the things that I might have sorted out without the actual ways documented by you concerning that question. It truly was a fearsome situation for me, but being able to see a new expert form you dealt with it forced me to cry with fulfillment. Now i’m thankful for your guidance and then have high hopes you know what a great job you were getting into instructing other individuals thru a site. I know that you have never come across all of us.